Coaching Special Olympics athletes is rewarding and makes use of the experience and knowledge coaches already have. In all sports, there are special rules and adaptions that make participation fairer, safer and more competitive for athletes of all abilities. The quiz below highlights aspects of Special Olympics kayaking that coaches and officials should know about. Test your knowledge! The Special Olympics Sports Department has developed this quiz to be a low-pressure way for people to test their knowledge of this Special Olympics sport. Every question has a single correct answer; if you select an incorrect answer, you know immediately and can choose again.As a result, everyone who takes a quiz instantly knows the correct answer to every question. The questions are drawn from information given on the Kayaking coaching page. It would be a great idea to check it out plus other resources on the Sports and Games page. 1) During all Special Olympics kayaking competitions, __________________ rules shall be employed, except when they are in conflict with the Official Special Olympics Sports Rules for kayaking or Article I. 2) Which of the following is NOT an official Special Olympics kayaking event? 3) Personal Flotation Devices (PFDs) are not strongly suggested, but not required, for all Special Olympics kayak practices and competitions. 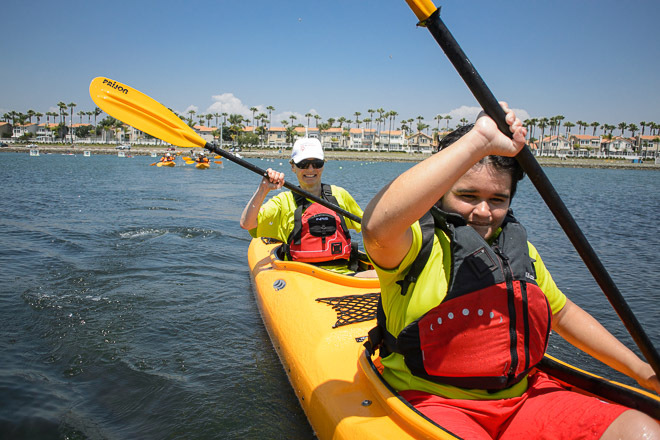 4) Prior to competing in Special Olympics kayak competitions, athletes must be seizure-free for one year. 5) Before an athlete can begin kayak training on the water, a swimming ability assessment must be administered. 6) If an athlete loses balance in the kayak and needs to get support, coaches can instruct the athlete to __________________. 8) In Special Olympics flatwater kayaking, it is recommended that athletes execute an Eskimo Roll to recover from a capsize. 9) Which of the following is NOT a start procedure step during Special Olympics kayak competitions? 10) When teaching athletes to paddle between their assigned buoys during competition, it is recommended that athletes correct their direction with ______________________. 11) In Special Olympics regattas, ______________ lanes are used during competition. 12) Doubles kayaking is an ideal Unified Sport ® provided that ________________________.